Companies may want to turn up the thermostat. Blasting the air conditioning doesn’t just run up energy bills, it may also be running up costs in lost worker productivity. In a small field study from 2004, Cornell University psychological scientist Alan Hedge determined that workers are more efficient when they’re warm. Hedge and colleagues carefully tracked the productivity of nine women working at an insurance office in Orlando, Florida. Their workstations were equipped with air samplers that recorded the temperature every 15 minutes. Productivity was tracked by software that measured their typing speed and errors for 20 consecutive days. The results showed that the women were significantly more productive when their office was kept at a warmer temperature. At 77° F (25° C), the women were typing 100% of the time with a 10% error rate. But, when the temperature dipped to a cool 68° F (20° C), typing rates plummeted and error rates rose to 25%. “The results of our study also suggest raising the temperature to a more comfortable thermal zone saves employers about $2 per worker, per hour,” says Hedge. Overall, Hedge and colleagues estimated that companies could save up to 12.5% of their wage costs per worker by raising the temperature a few degrees. Additionally, studies going back to the 1940’s have shown that the temperature can shape emotions and perception. In a study published in Psychological Science, Utrecht University psychologists Hans IJzerman and Gun Semin demonstrated that a room’s temperature has a direct relationship with social relations. In one experiment, they varied temperature in a room from the low 60s F to the low 70s F. They then showed a group of 52 volunteers a short film clip and asked them to describe in their own words what was happening. IJzerman and Semin hypothesized that room temperature would influence the volunteers’ perceptions, and hence the kind of language that they used in their descriptions. Those in a warm room would write concrete descriptions of the scene, while chilly volunteers would write more abstract descriptions. That’s exactly what they found. When the language from the volunteers’ narratives was coded, they found that temperature did indeed affect the volunteers’ choice of words: The group of warm volunteers expressed greater feelings of closeness toward the experimenter. 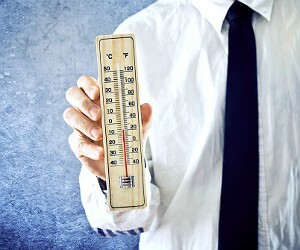 Of course, a workplace that is too hot can also be detrimental to people’s productivity. Several other small studies have found that higher temperatures can also adversely impact people’s productivity, particularly once the temperature starts creeping above 77° F (25° C). However, the formula currently used to determine standard office temperatures is calibrated based only on men’s body heat production. A new study, published in Nature Climate Change, suggests that women’s average metabolic rate is 20 to 32 percent lower than this; a finding that helps explain why there’s so much grumbling about frigid offices. While it’s probably impossible to come up with a temperature that will please everyone, the researchers propose adjusting the current thermal model to include the metabolic rates of women as well as men. Hedge, A., Sakr, W., & Agarwal, A. (2005, September). Thermal effects on office productivity. In Proceedings of the Human Factors and Ergonomics Society Annual Meeting (Vol. 49, No. 8, pp. 823-827). SAGE Publications. I need to know more of this article and can anyone sue if this condition continues to happen. Who should be held responsible if something happens to me or my job? I work in an office at a motel 2 to be exact and the owner simply will not let us turn the heat up past 67 in the winter and in the summer we can’t turn the a/c lower 77. We live in Texas weather is always changing. When it’s hot it’s hot, and when it’s cold it’s cold! Their really should be a law against this.